Why is it so hard to pick your character's appearance? I always need about one hour to get it working, and sometimes even then I'm not satisfied and delete my character after all. Same for Mass Effect 3. 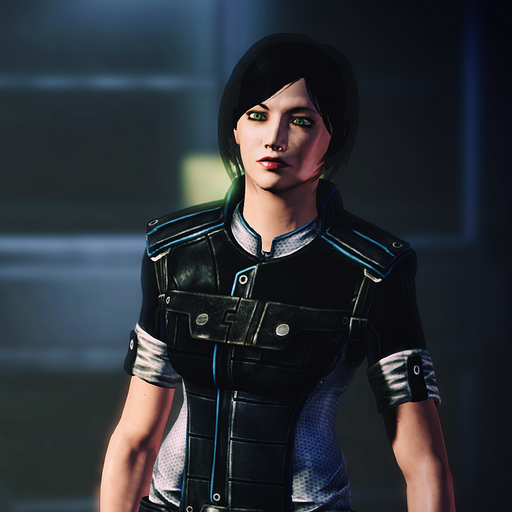 My imported Mass Effect 2 character looked horrible in Mass Effect 3, so I really had to change some things around. Luckily there were new hairstyles to help me. Hairstyles! One of the things that really makes or breaks a character for me. 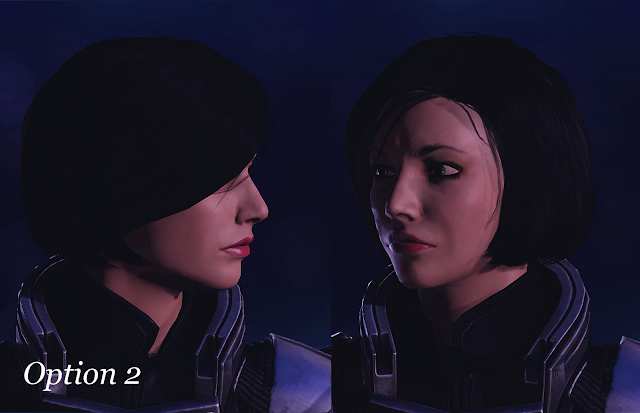 This one is basically my old hairstyle in Mass Effect 1 and 2. I never have been fond of it, though, and it looks a bit old fashioned. Another option, perhaps a bit more ladylike. It reminds me of Dr. Chakwas. I guess it looks great on the doctor, but I'm not so sure about myself. This was the last hairstyle I found fitting. It looks more cool than the previous ones. I think I'll stick with this one for now. I'm still not totally satisfied with her general appearance, though. What do you think? 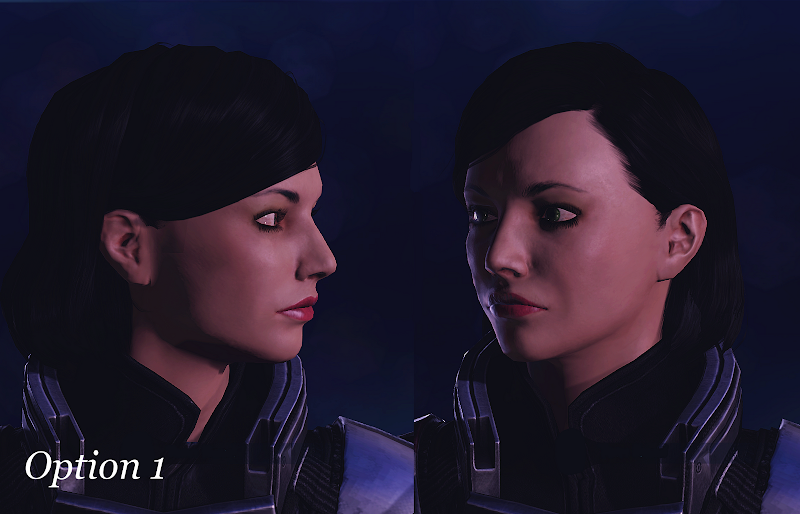 One thing about Mass Effect is that the characters in the game actually look a lot better than on the creation panel. This is a good thing, as I otherwise probably would have run off in despair. An example of my current character ("option 3") to the right. Looks a lot better, right? I might be able to live with this, if I can get used to her. I honestly don't understand myself why I care so much about game appearances. In real life, I usually don't even look in the mirror. If I travel by public transport, more often than not I'm combing my hair in the bus because I just plain forgot to do it in the morning. And that's not because I have this hair that doesn't need care - on the contrary, I have this really long hair that I'll never get apart if I skip combing it. I guess I'm just illogical, as Mr. Spock would say. Biotics now look really cool! I'm not really sure what they changed, but each time I cast a power, it looks great, much more realistic than before. Movement is very dynamic. Sliding over crates, jumping over gaps... all just made everything much more realistic. The whole thing feels like as if you're in a movie. Debris falls just before your feet, a building collapses as you run past it. 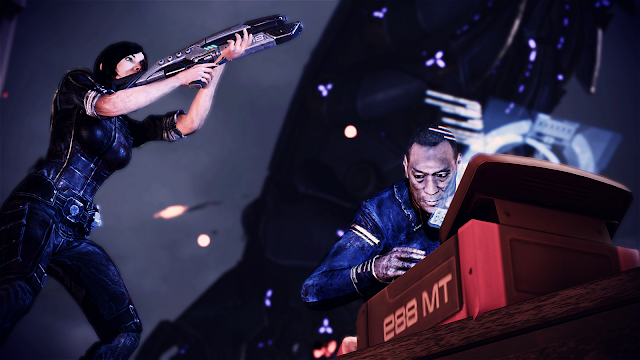 There are much more cutscenes when things are happening. 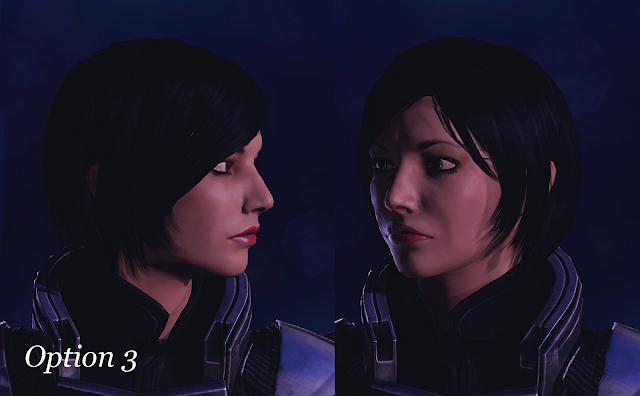 I'm not sure if it will stay like this, but Mass Effect 3 makes a much more realistic experience than the previous games. I think I used the word "realistic" a bit too much in the past sentences! I think you get the idea now! I guess I'll just have to play further to see what happens. The whole story is pretty scary, though! Hopefully I'll get used to my new character appearance soon as well. Character creation screens are the bane of my existence! I LOVE them though, I spend ages playing with hairstyles and looks. And games just do NOT have enough hairstyles. ahem... tap... tap... /me backs away from microphone and whispers quietly: You know, that lame MMO that isn't a game that some peeps like for whatever reason... does have lots of RP Sims to play on... and... about 18 bazillion wigs to choose from! I so know what you mean! I'm particularly annoyed that games never include the option for having long hair. I seriously cannot remember a single game in which you are able to have real long hair. The only way is to mod it in (if that is even possible). But you know.. this obsession is a BIG PROBLEM for me when I am starting a new MMO and want to save my name... I've lost my name before in games when I didn't get to it first, and sometimes I wonder if that is because I am stuck in character creation looping through the same screens, fine tuning absolutely everything possible lol. LOTRO: Should you play a lore-master?